If you are after smiling faces and the sound of laughter, then Magic Charlie is here to help. Charlie has performed his shows at literally thousands of kids Birthday parties across the UK and during his many years as a professional children's entertainer and family magician, his aim has always been to make each party as fun packed and memorable as possible for the children and a totally stress free experience for parents. 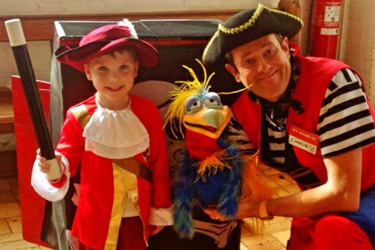 Charlie involves everyone in his performances and will make your child the absolute star of the show. Charlie's various comedy, magic, games and disco shows are a laugh a minute and are equally suited for both boys and girls. 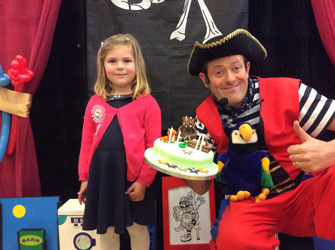 The shows are ideal for children from 3 years of age upward and Charlie can perform in many various guises such as: a Clown, Magician, Pirate or a Wizard and all his shows are themed to compliment each character individually. Your child's Birthday party is an event that should be remembered for a very long time after their big day and that's why Charlie does his utmost to make it as magical and memorable an occasion as it possibly can be. The hilarious comedy magic show is ideal for parties where you the parent/s may want to get more involved and will conduct your own party games, supply your own music and prizes etc. 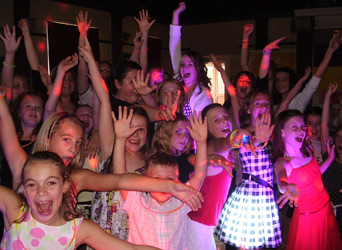 Or maybe you have a bouncy castle booked and just need a short performance to enhance your child's Birthday party. This show is very colourful and interactive and there's lots of laughter and audience participation to give lots of the children the chance to join in and come up and help. There's not only magic, but puppets, juggling and plate spinning. 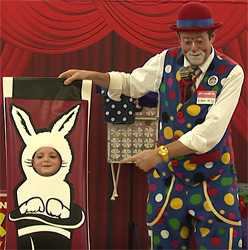 Also at the end of the show, they get the chance to meet either my Pet Parrot Pongo or Presto the magic Bunny, who will magic up goodies for everyone. Duration: 1 Hour of non stop entertainment. This show has all the amazing features of the comedy magic show above but with added music and a great party game too. This package has all the fun of option 2 above, but also has lots more games, music and dancing. After my performance I will then hand the children over to you where I suggest you sing happy birthday, leaving time for someone to cut the cake whilst the children enjoy their party food before home time. I'll run the whole party for you in a calm, controlled manner from start to finish. That's why it's called 'The parents favourite' As you get a chance to relax, sit back and enjoy the party too. 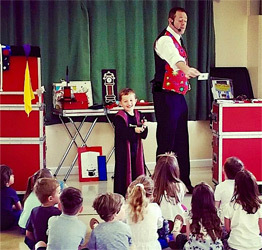 There's so much to keep the children focused and entertained such as: Amazing comedy magic show (see above) with lots of audience participation. There's plenty of fun (non elimination) party games too, mixed up with some more traditional games such as pass the parcel, best dancer, corners and many of My very own tried and tested popular favourites. The birthday child/children receive: Quality Birthday gifts, a full colour Magic Helpers Certificate, fully personalised with their name and the Date of the party printed on it, that they can take away as a great keepsake of their special day. I will also make them a fantastic balloon model. I supply a state of the art theatrical backdrop (space permitting) a top quality professional sound system and microphones, There is also a lot more opportunity for dancing, if you so wish and all the music will be everything from the latest chart hits to the older favourite tracks too. There are also lots of great party dances which I will perform along with the children. After about an hour into the party I will get the children into a conga chain and lead them to the tables and get them seated for you, ready for the party food. (Which you supply) I will then put on some calmer background music such as Disney tracks or slower chart songs while the children eat. As soon as the children have finished eating I will lead them away from the tables back over to the performance area where I will carry on with more fun, magic and games until it's time for the children to go home. I supply all the prizes and giveaways needed throughout the entire show and no child is ever left out. Every child leaves with a goody, and a full colour souvenir photograph to take home with them.The children (and adults) are guaranteed to have a fun, fantastic time. Add a couple of Disco lights to enhance the music, magic & games package above. State of the art professional disco lights. 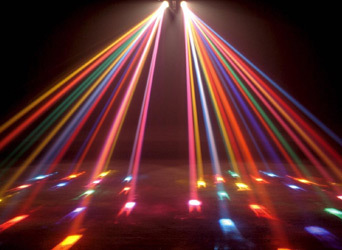 Lasers and special effects - that will fill any sizes hall with colour. Children simply love the lights and effects in this package. The look on their faces when they see the hall totally lit up in colour, is priceless and will be remembered for long after the party. Please Note: On all the packages above there are no limits on the number of children attending. I was very happy with Charlie the Clowns service. He kept the children's attention for the full 2 hours and they loved him! Everybody staff and children really enjoyed the show, we will book Charlie again , well done!